I am getting “shook down” and inspected very thoroughly as I get through the gate in a Mexican maximum security prison. There are guards high above, up on the walls with AK-47s. This is where high risk inmates deep in the heart of Mexico are incarcerated. I am not sure what to expect as I prepare to speak to about three hundred convicts dressed in khaki uniforms. I am accompanied by my friend and mentor Johnny Moffitt , a former motorcycle gang member from Texas. Having been locked up in the seventies, he loves convicts and they love him. He has been doing this for almost forty years and has been in prisons all over the world. He and I met when we were booked to speak at the same prison ministry conference in Orlando and were mistakenly put in the same room, and literally had to sleep in beds that were four feet from one another. We have been friends ever since. Speaking with an interpreter is an interesting experience. There is a rhythm that develops and it becomes like a dance. Unlike speaking to American audiences, you have time to think of your next sentence for longer than usual. The inmates look at you, then look at the translator and respond. There is a delay before they laugh or cheer and it is fun to wait for it. These men are intense and hanging on every word. In the crowd I know there are cartel members, drug dealers and murderers, but they are not what you would imagine. After the message, they line up to come and pay their respects and ask questions; more so than in U.S. prisons. They are so grateful, at least they were with us. I would not know how they act when we leave or before we come; I just know that around us there is a mutual respect and dignity, regardless of our differences. Our host is a beautiful evangelical church in Puebla, about an hour from Mexico City. The pastor there is a former Miss Mexico and she and her husband lead a ministry that is exploding with a number of different locations in multiple cities with tens of thousands of converts. Because her churches are not mainstream and are growing so fast, she has been heavily persecuted by the more powerful religious denominations down there as well as those practicing the occult. There have been plots to kidnap her and kill her from time to time, and they live on a compound with high walls and armed guards to protect them. But still she boldly preaches and her churches continue to grow. Her driver is a former government body guard who now works for her to provide protection and security. We preached at her church several times while in Puebla and our team stayed on the compound. These were the most hospitable Christians I have ever met, and I have met them all around the world. What made this trip a little different and definitely more difficult was the fact that I had broken my shoulder pretty badly just a few days before this trip. 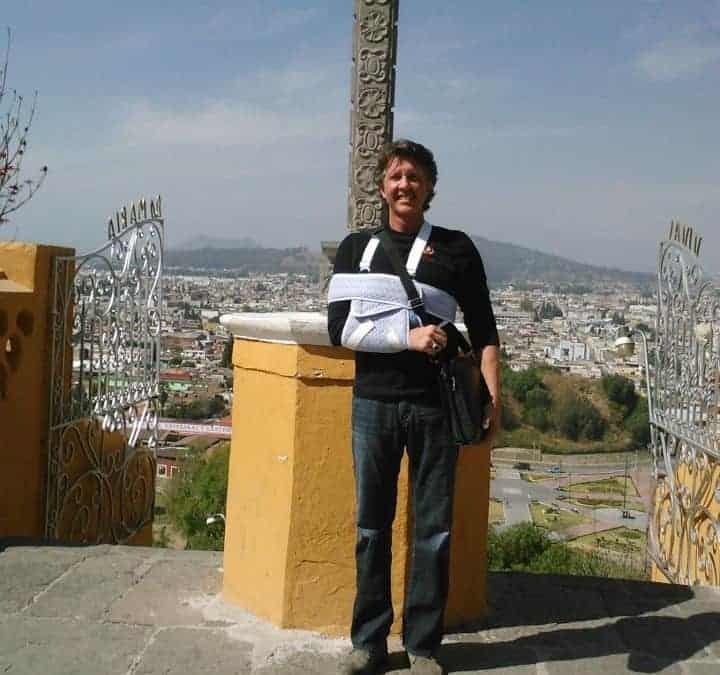 The doctor had told me that I shouldn’t travel and that I would need surgery to repair the broken shoulder joint. Well, there was no way that I was going to cancel this trip and that was all there was to it. So he set me up with a super-sling that not only kept my arm in the right slot but also wrapped around me and held my arm tight against my body. With a little pharmaceutical help, I was on my way to Mexico. I figured it would only help in some of the dangerous places we were going! That Friday evening we had a large worship service in this mega-church. I had mentioned to Pastor Sheets, who was leading our team, that I wanted him to have our team pray that I wouldn’t need surgery when I got back to the states, because I didn’t have time for it. Pastor Sheets has been preaching all over the world for over fifty years and has done this type of service many, many times. He began by saying to the large audience “The Lord spoke to me this evening, and He told me that we needed to have a healing service. You see we have this young man on our team who recently broke his shoulder. The doctors have told him that it will require surgery, but he doesn’t agree with that. Tonight we are going to pray for him.” Now you must understand that I wasn’t raised in this type of church. These were Holy Ghost Christians and just didn’t fit into my box. I was quite uncomfortable that he had called me out. He went on: “I’d like to ask this young man to stand up, right there on the front row.” I was embarrassed, and my face turned blood red. I reluctantly stood up and they began to cheer for me. I wanted to sit back down, but then he started to sing in one of the most beautiful voices of prayer that I had ever heard. I still didn’t believe in what he was doing, but I wasn’t going to get in the way of this beautiful gesture. Slowly, one by one, beautiful Latino worshippers began making their way to the front and they began to lay their hands on my shoulder. I was resisting gently, until I finally closed my eyes and endured it. Suddenly I heard what seemed to be a very clear voice, but no one was speaking to me. It said, “Are you really going to be so arrogant that you do not accept the gift that I am trying to give you?” I slowly lifted my good arm above my head and just let go. I focused on the song, the vibe, and the spirit of this wonderful, loving congregation and went with it. We finished that night with lots of hugs and a few tears, and then we continued with our prison tour. I can’t tell you that my shoulder was immediately healed, for that is not my story. But I can tell you that when I went back to the Emory University Specialist in Atlanta upon my return, he looked at the new x-rays and scans and told me that I did not need surgery any more. Today my right shoulder, the one that I had broken, is much stronger and more mobile than my left shoulder. I had learned a very valuable lesson: stop thinking you know when you don’t know, and stop trying to put Him into your own box. He doesn’t live in boxes, nor does He fit.